Let a Tax Fighting CPA fight for you, for any amount. We are the only Tax Fighting CPA or tax resolution firm who wants to fight for you for any amount. We are tax audit and resolution specialists. Our expertise means you save time, money and aggravation. Many are upset by IRS or state tax notices. I often have them use a special word, R-e-e-e-e-e-lax! You cannot say “R-e-e-e-e-e-lax” properly without taking a big breath, which makes you relax, as you should. Those trying to scare you say IRS is the most aggressive collection agency, which it is. However, none of my major drug dealers clients ever went to jail for taxes. IRS only jails those committing the biggest tax frauds. Recent statics show there were about 2,700 convictions out of 239 MILLION tax returns, or less than 1 in 100,000, so R-e-e-e-e-e-lax! You simply must give me enough time to help you. You rarely need worry about many 10 day to 30 days tax notices you get, especially after you give me an IRS Power of Attorney (Form 2848). Most notices mean IRS will send a new notice, until one says Final Notice of Intent to Levy. However, even then, look carefully for “and Notice of Your Right to A Hearing.” This shows we have 30 or more days to appeal. I actually am glad to see some so-called Final Notices, because they are what we need to start effective appeals if clients missed earlier notices, so R-e-e-e-e-e-lax! The worst I will ever let happen is a payment plan that you can afford (or I will renegotiate). None of my final results ever upset a client. We do not ask if you owe $5,000 or $10,000 in back taxes. Let a Tax Fighting CPA fight IRS (or any state tax) for you, for any amount. I hate IRS and our wasteful, overly complex and unfair tax system. Let us fight IRS for you, since you or your bookkeeper will otherwise pay extra tax, extra penalties and extra interest. Our new Tax Fighting CPA programs let us automate IRS power of attorney filings, with automatic reminders. We also see IRS records fast. This includes payments, charges, balances, income, rejection codes, rejection reasons and more. Our new program even knows if you will be examined for up to two years in advance or get a tax notice for up to two months in advance. This les us fight IRS much harder and much more effectively. We work together to complete one Tax Fighting CPA questionnaire. Our program then generates many essential Tax Fighting CPA forms. This includes Form: 12153 (collection due process or other hearing), 433-D (income statement), 656 (offer in compromise) and 9465 (installment payment agreement, which can include big discounts and no liens). We get reports of all penalties qualifying for first time abatement. This covers far more than late filed S Corps or partnerships. The programs we use are rather expensive, but they save us lots of time and point to many big tax protest opportunities. Automation lets us charge very little to fight IRS (or states). It includes fighting over audits, compromises, payment agreements (including Fresh Start), interest and penalties. This even includes the statute of limitations, jurisdiction, repetitive exams and uncollectible status, which are areas many tax resolution firms miss. In doing this, I never talk about going with you to IRS. I am very aggressive in trying to confer with IRS (or states) ALONE! I adopted this policy after a new client, who stated an exam without me, tried to correct me about something, when I was sure that what I said would close the case. Two national CPA firms had me in their tax departments, starting immediately out of college, which is very rare. I soon began writing for publication, though few of my articles carried my name. My idea of a vacation included many visits to clients I never met, though we often talked. I also visited the North Carolina Department of Revenue, to ask to extend a tax notice reply. This made a Supervisor laugh, so he and many of his staff enjoyed lunch with me. I also aggressively handled many IRS and state tax notices and exams for many very large clients. As a Tax Fighting CPA, I always insist agents cite laws to justify extra tax, penalties or interest. After checking them, I make lists of good and bad agents, with knowledge areas. My national CPA firm had my list typed and distributed to all tax staff within two years. No Problem! 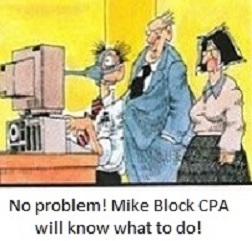 Mike Block, the Tax Fighting CPA will know what to do! Soon after starting my practice I got many airline pilots as clients. There were then few limits on tax shelters, so many used them. Clients also created shelters, so a 1978 pre-PC computer did 18 projections of occupancy, interest rate and term for each shelter. Each report took an hour, with only three numbers changed, so a college student ran them nightly. Clients also used S corp tax shelters. Some had different companies for a plane, boat, wife and girlfriend. There were many audits, but clients paid a small percentage of tax return fees for audit insurance, covering my fee to represent IRS and state audits. A spreadsheet tracked audits. IRS initially assessed more than $12,00 per client (average) in extra tax. However, after many appeals, including U.S Tax Court appeals, the average client paid less than $100! I do not know any CPAs filing many Tax Court appeals, but that is how to get good settlements fast. Some Tax Fighting CPA exams were very memorable. A new client transferred partnership, S corp, C corp and rental income to one bank account, from which he paid all bills. This risked a big extra tax, but a new agent proposed only $70 in extra tax. I had him compute interest and paid him myself. This made it less likely IRS review would reject his report. Some state tax exams propose fairly big income changes, but little tax. However, such exams go to IRS for much bigger tax, so I appeal. The IRS statute of limitations often expires before the time of the state appeal hearing, so all is well. Other exams involved non-local IRS offices, so I requested office changes. IRS refused until I said there would be Tax Court protests, which let us select offices. We then often got letters dropping the exams when they arrived at new offices. This is the type of Tax Fighting CPA you need, so please email mblock@blocktax.com.